A few years ago, I received a phone call from one of our tenants stating that one of their outlets wasn’t working and needed me to come take a look at it. After arriving at the unit and spending not more than 30 seconds looking at the outlet, I was able to determine that the tenant had tried to install a new special outlet with a USB plugin. However, it was wired incorrectly and could have possibly caused an electrical fire. Flash forward to today – I received another phone call from a tenant stating that their outlet was working and now it wasn’t. I’m sure you can guess how it turned out. As a result, I decided I would share with you a step by step guide on how to safely wire an outlet for your home. Wiring a home outlet is relatively simple if you follow these simple steps and connect the correct wires with the correct screw on the outlet. Note: To be able to show the wires easily, the example shown below only has one electrical wire comprised of a “Hot Wire” that is Black, a “Neutral Wire” that is White, and a Copper Wire that is the “Ground” wire ). Some outlets may have two or more electrical wires that are in the outlet electrical box. While there may be more wires, you still need to connect the correct colored wires with the corresponding colored screw in the outlet. To wire A home outlet, always connect the Black “Hot Wire” with the Gold colored screw on the outlet, the White or “Neutral wire” with the silver screw, and the copper Ground wire with the teal colored screw on the outlet. Before starting any wiring job, gather all the tools and equipment together so that you will have everything ready to go and won’t need to leave the outlet unattended while you go looking for the screwdriver or pliers. Here is the list of items you’ll need. Electrical Wire Stripping Pliers: These pliers are made specifically for wiring outlets in your home. It has notches with blades that are perfectly designed to cut and strip the outer wire coating off allowing you to properly connect the wire to the outlet. Additionally, they have a built-in wire cutter and crimper.The pliers are designed so that you’ll be able to work with a variety of different wire gauges that are commonly used in homes or at many commercial jobs. Phillips Screwdriver: You’ll need a Philips screwdriver to remove the screw holding the outlet to the electrical outlet box. Flathead Screwdriver: Once the outlet has been properly installed, you’ll need to install the safety outlet cover with the flathead screwdriver. Current Tester: The is the most important tool to have when installing a new outlet. The current tester is used to ensure that all electrical current to the outlet has been successfully disconnected or shutoff. New Outlet: The new outlet that you’ll be installing. Working Gloves: The wires and outlet itself usually have some sharp edges. Always use good fitting gloves when working with sharp objects. Once you have all of your tools and supplies gathered, you’re ready to start the process of replacing the old outlet with the new outlet. Locate the home’s Breaker Box and shut off the power to the outlet on which you will be working. – The Breaker Box takes the electricity that is coming in to the home from the electric company, and safely redistributes the electrical current throughout the house through the electrical wires to the many outlets, lights and appliances. The breaker box allows the electricity to be safely delivered in the correct amount of voltage to the standard outlets (120 V) throughout the house, and a more powerful voltage (240 volts) to the oven, washer/dryer, refrigerator. 2- Remove Outlet Safety Cover: Using the Flathead screwdriver, remove the outlet Safety cover. 3- Pull Outlet Out: Using the phillips screwdriver, remove the screws holding the outlet in place. Pull outlet out of electrical outlet box by carefully touching only the top and bottom of the outlet where the wires are not touching. 4- Current Tester: With the outlet pulled out, use the outlet tester to ensure all current has been disconnected. If the tester detects electricity it will beep or show a current meter notifying you that the wire is “Hot” and you are at risk of shock. If this is the case, return to the breaker box and locate the switch that is powering the outlet and turn it off. 5- Disconnect Old Outlet: Using a phillips screwdriver, disconnect the old outlet from the wires. Be sure not to remove the screws completely from the outlet itself so you don’t lose them. Just loosen the screws enough to free wires. Note: Wires may have a curved shape at the ends where the wire wrapped around the screw on the outlet. If this is the case, do not straighten wire out, use the same curve to connect the wires to the new outlet screws. 6- New Outlet: Connect the wires to the new outlet by creating a curve that will wrap around the screw head of the new outlet. Be sure to have the curve wrap around in the direction of the screw head being tightened so that it will tighten the loop on the outlet and not loosen the wires. *Use the chart below to know which wires to connect to the outlet. 7- Turn on Power and Test: Once the wires have all been connected to the new outlet, return to the breaker box and flip the switch to allow the current to run to the outlet. Using the current tester, ensure that the outlet has power. 8- Turn off power and secure outlet: Return to the breaker box and shut off the power again, Then, using the phillip screwdriver, secure the outlet firmly to the electrical outlet box and place the outlet safety cover over the outlet. 9- Turn On Power & Test: After you have finished putting the safety cover back on, flip the breaker switch back on for the power. Once the power has been restored, test the outlet by plugging in a light or some other device that uses the outlet and turn it on. 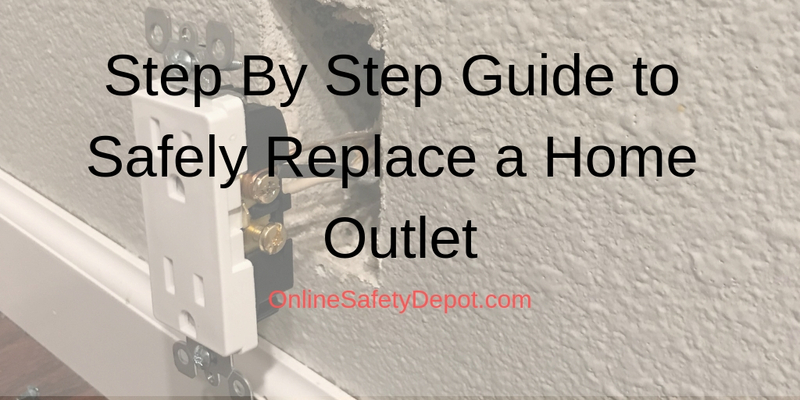 Follow these simple steps and you’ll be able to safely install or replace those old outlets with new ones. Be safe and remember to always disconnect the power to avoid electrical shock. Next post: How to NOT fall on the Ice!